Today was awesome! Armed with rest and some food, we got out and explored the city. 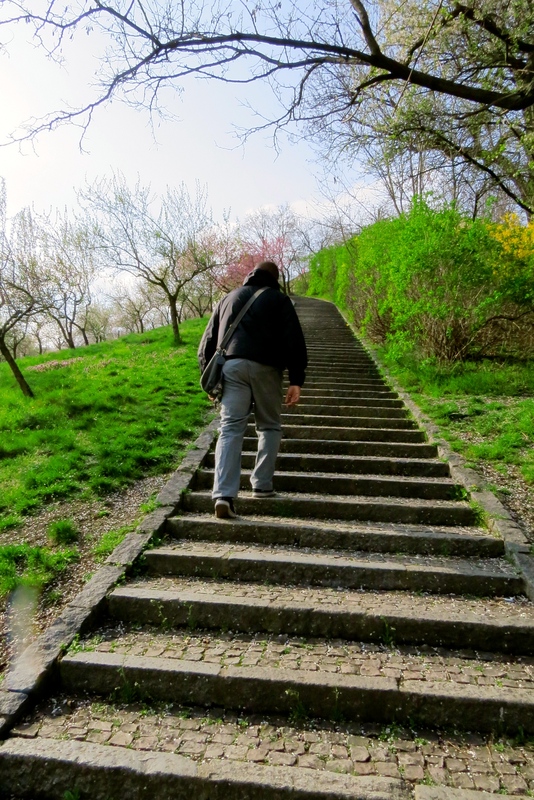 It was also a serious test of letting God lead me where He wanted to lead me, because once again all of my plans were completely thrown out the window! Considering that the evening before Nick and I had gotten over two hours of sleep in the middle of the afternoon, sleep last night didn’t come as easy as you might think that it should have with the 4:00AM start time. We still got up at a reasonable time this morning and enjoyed breakfast in the hotel. 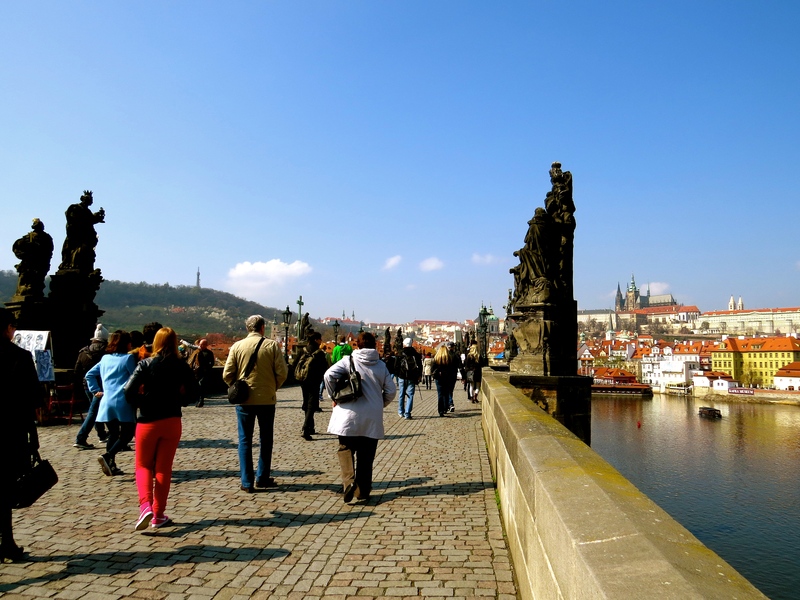 The plan for the day was to go on a walking tour, and then head across the River Vltava to Lesser Town to explore. We got out of the hotel a few minutes late, which meant that we got to old Town Square a few minutes late, which meant that we completely missed the tour (apparently, they operate with British Airways style efficiency). In Scotland, and in Hungary, the free walking tours companies all do a really good job of separating themselves as to not confuse the tourists. In Prague, they do the exact opposite. There are SO MANY free walking tours and they all compete for the tourists in order to get the tips. We were offered a tour by one lady, but we declined. I’m finding in tough to trust some of the people here as several guidebooks warn you that they can be scammers. This meant that we had to regroup! We had a hard stop at 4:00pm because we had to check out of the hotel and move to the flat that we were going to be staying in. This put me in a tough spot. I didn’t want to do the later tour because it might run over and then we’d be running back to the hotel to check out in time. We decided to walk across the river and explore Lesser Town, and check out of the hotel before doing the later tour. 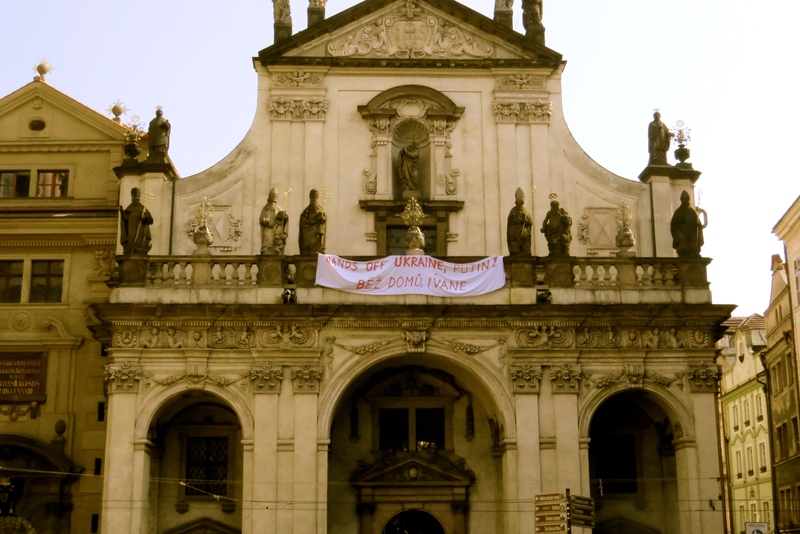 On our way to cross the Charles Bridge we saw a sign hanging on an old church that said: “Hands off Ukraine, Putin!” You can definitely tell that there’s slight tension in the air with this international issue. The Charles Bridge is a pedestrian bridge in Prague and it’s beautiful. Not only does it give an amazing view of the Vltava, but it also has different statues of Jesus and other Biblical stories. I felt a transformation as soon as we got off the bridge into Lesser Town. I don’t know if everything clicked and I finally felt welcomed to the city, but people were smiling, children were running around happy, and there was no graffiti on the walls. 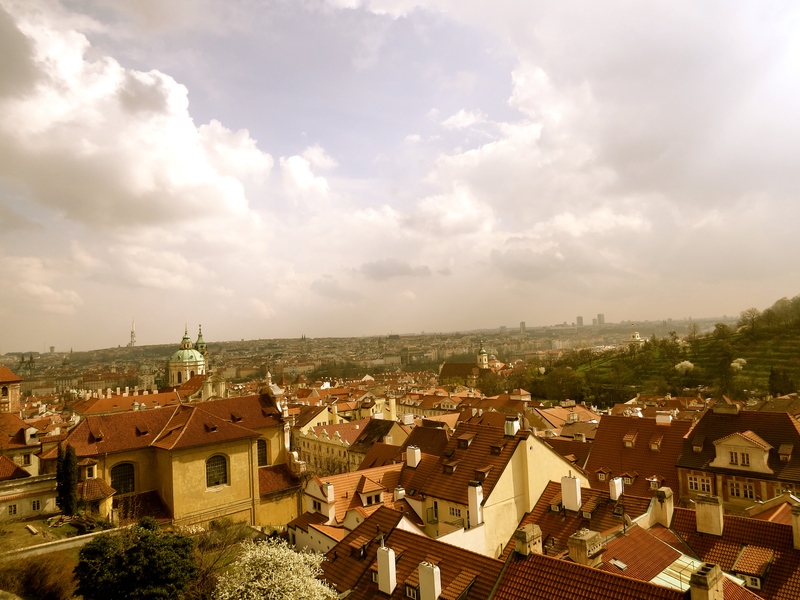 It was the moment that I started to like Prague. After spending a very short time exploring a little of this part of town, Nick and I quickly decided that we wanted to completely ditch the walking tour and spend most of the day in Lesser Town. We took the tram up to Prague Castle, a large castle dating back to the year 880. While we didn’t end up exploring the castle, the views from the top were amazing! After spending a few minutes enjoying the view, Nick and I decided to grab lunch at this terrace café by the castle. I had some delicious pasta, and Nick had some schnitzel. After going back for one last look at the view, we saw across the way there on this hill there was an American flag flying. I love seeing the American flag when traveling abroad. It’s like a little piece of home. Nick and I decided to investigate what it was. By the time we walked over and started up the incredibly steep hill, we realized that were was a very large fence with barbed wire between us and the American flag. Upon doing a little research once we were back in the hotel, I found out that it was actually the American embassy (…duh…). Up to see the American flag. It was now time for Nick and I to head back to the hotel and check out. We took the tram all the way back – now experts on the public transportation system in the city. When we arrived back on the other side of the bridge, I expected to feel down again having returned to this part of the city. Instead, I felt great! We checked out of the hotel and lugged our stuff down the street a few blocks to a flat hotel that I’d found. We were greeted by two very nice gentlemen who showed us our flat. I almost cracked up when I saw Nick’s face when we walked into the flat. We were so blessed! I had made the reservation for a one bedroom, however, we were upgraded to a two bedroom apartment! The apartment is complete with a full kitchen, Jacuzzi in the bathroom, and Nick’s room even has a balcony. Even though it was only a few blocks away from the hotel, the energy in the neighborhood was completely different. Our flat looks out on the inner garden, and it’s so quiet and peaceful. If we come back to Prague, this is where we’re staying!!! The original plan for the evening was to go to a classical music concert. However, as I was sitting on the couch, all I wanted to do was take a nap! Nick and I decided to make it a night in. Instead of going out to dinner tonight and breakfast tomorrow we went to the grocery store. This was an adventure in itself. 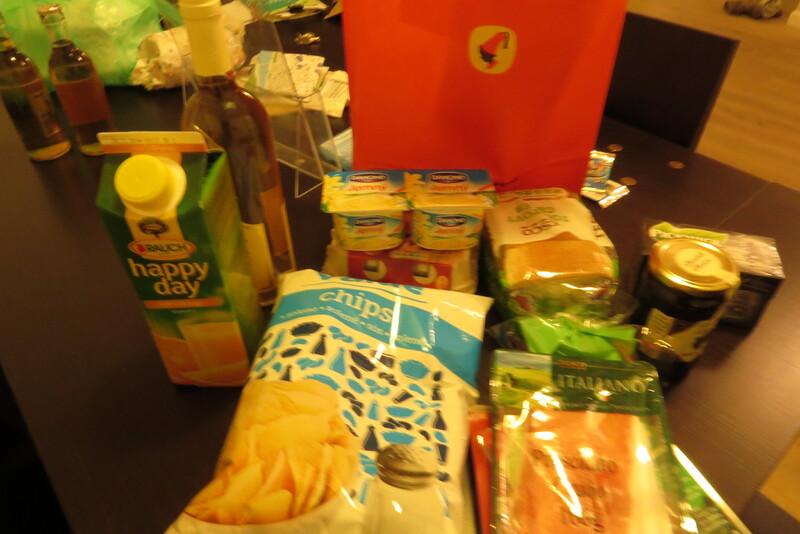 There was a lot of guesswork that went into what we bought. I’ll tell you tomorrow if what I think was butter is actually butter, and if some of the lunchmeats were bought are what I think they were…Life’s an adventure, right? After going to the grocery store, we stopped by a Chinese food restaurant to get some takeaway, now post-dinner, we’re both sitting on our Macs soaking in the day, and enjoying the fact that we actually have a table to sit at in a lovely, peaceful space. UP NEXT: Countryside! We’re headed to Karlovy Vary. This is where Casino Royale with Daniel Craig was filmed during the casino part of the film. Here’s hoping people this far from Prague speak English! I’m back in Europe! This time I’m spending sometime in Scotland and the Czech Republic. Once again I’ve got my sidekick brother, Nick with me. European Adventure Part IV started off with a bang – and not a good one. First, on driving to the airport we ran into a huge load of traffic due to an accident that delayed our arrival by an hour and a half. This meant that we were arrived at the airport only an hour before our flight was to depart. As I’m telling the woman behind the British Airways desk that we ran into traffic, she’s telling me that the flight’s closed, and Nick’s face is nearly comically terrified as he realized that he’s forgotten his passport at home… Home is 40 minutes away in traffic. I looked up flights we could rebook on for later, while he went to go get his passport. I was not happy about this. In reading my adventures over the years, you may have realized that I’m a bit of a planner…and a planner does not like to have their plans changed. A good planner, which I like to think I am, is good at adapting when the change comes, however. While Nick went back to the house to get his passport, I sat with my feet propped up on my luggage outside of the British Airways ticketing stand watching the line grow, and plotting on how to adjust to this major change in plans. I felt myself getting more and more worked up thinking about how much time we were missing in Europe, and how this was not a good way to start my vacation. Originally, we were supposed to get to Edinburgh by 10:30am, explore for a bit and go on a walking tour. Now we were going to arrive at 1:30pm, and miss basically everything that I planned. I started to get worked up. Then I realized that I was going on this vacation at the will and pleasure of God, and that it wasn’t really my vacation (as it wasn’t my money paying for it), but His. Furthermore, after doing some math I quickly realized that we were only losing three hours, and three hours is not worth crying tears over. Nick eventually came back to the airport with his passport, and we changed our flights (that change flight fee was not easy to shallow! ), we made our way through security and grabbed a Potbelly sandwich for dinner. I took two Advil PM, I had stress headache brewing, and was knocked out for nearly all of the flight. When I opened my eyes the sun was shining, and it looked like it was going to be a beautiful day in London. There’s something so familiar about landing in Heathrow Terminal 5. I know exactly what to expect, know the places I like to eat, and understand the building very well. Nick and I grabbed a leisurely breakfast at Gordon Ramsey’s Plane Food and just soaked in being back in the United Kingdom. After our layover we got on a domestic flight to Edinburgh. When we landed the sun was still shining. We took a quick bus ride into the city centre to get to our hotel. After arriving at the hotel, Nick and I promptly checked in and took a nap! When we finally got up it was time to explore. 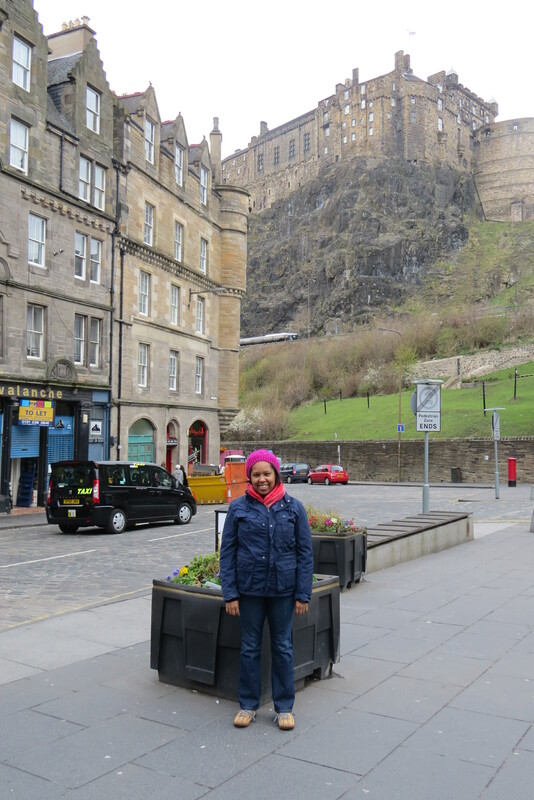 One of the main features in Edinburgh is Edinburgh Castle. It’s this huge fortress built on this hill that used to be a volcano. It’s so formidable and bit ominous just sitting in the middle of the city. Our exploration for the afternoon was just a huge loop around the castle. It wasn’t long walking the streets before we began to hear the wail of bagpipes. 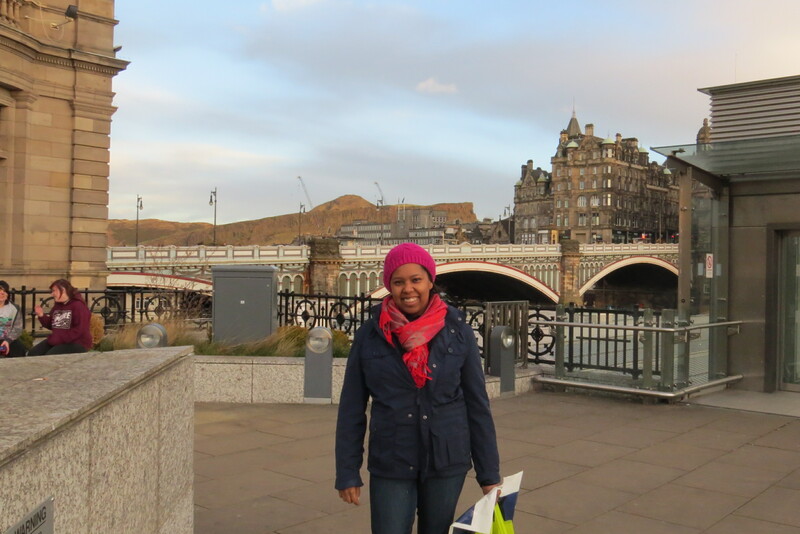 We were officially in Scotland! I know it seems so touristy, but it was pretty cool. We walked over North Bridge and before we knew it we were able to see Arthur’s Seat. 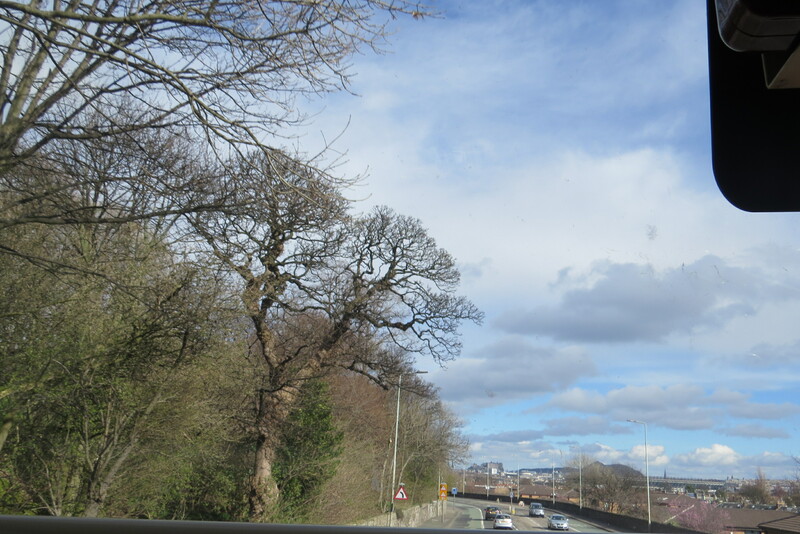 This is an extinct volcano that’s really close to the city centre. We’re considering hiking up it. Jess and a view of Arthur’s Seat. We continued walking around the Castle while we headed to Zizzi’s for dinner. This is the same restaurant that we enjoyed in London. It was nice to spend our first night in a place that was familiar, and had delicious food. I got prosciutto wrapped chicken. YUMMY! With the sun set, it was freezing outside and Nick and I hurried our way to back to the hotel. Now I’m enjoying a mojito in a can. A lovely day overall in spite of how this trip started. UP NEXT: The current plan is to explore Leith and finally go on that free walking tour…but we’ll see how that goes. Can I explain how wonderful it is to travel to a warm place from a cold place? I don’t think I can put this into words. So, a couple of days of being on the West Coast, I fly back across country for another meeting. This is a meeting that I had a lot more ownership over since I’ve been handling the logsitics from the beginning. Everything went wonderfully. It probably helped because I landed and saw palm trees. That always lightens my disposition. Greeness? Eh…yeah. They’re working on. It’s just interesting because I usually go to cities that are battling it out to be the greenest city in the country(Chicago, Boston, Seattle vs. Portland), and I don’t even know is Phoenix is aware that race is going on. Talk about urban spawl. Of course, the facilites we used had to upgrade on the green factor for us to even consider going to meet with them, just as our hotels do when we take our show to a city. That’s one of the things I really enjoy about what I do, is that I feel like you can see a difference in the way that a city words during the entire process of taking the show to their town. This trip was quite an adventure. Not only did I find out that I was going just a few days before I left, but it was also my first time on the West Coast. I was worried that I’d be sooo bored during the flight, but delightfully, I wasn’t. This was also adventure because I wasn’t quite sure about the event space that I was going to be using. Outside of running out of food or losing power, I feel like this is something that’s VERY scary for an event planner. Especially when you’re dealing with a high level meeting like I was. Eventually, I moved the meeting down to another floor and the meeting run exceedingly smoothly. Seattle was a great city to work in reference to greenness. I don’t know what their overall “rating” is from the meeting’s industry, but I found it easy for the caterer and the meeting space to meet all of our greening needs. I stayed in a Kimpton, so of course my needs were met there. I did also get a chance to spend some time walking around the city which is something I love doing. I definitely have the gene to explore in my. I always want to get out and see what’s going on. I have a lot of trips coming up in the next few months, so I hope to have a chance to explore those cities, too!